WOW, it's been a long time since I've done a blog review. So many companies prefer Facebook or Instagram posts for reviews, but sometimes there's just so much you want to say that a blog post just makes more sense. Such is the case with the Ellie Claire Art Journals. Contributing to the need for space is the fact that there are actually 3 journals that I will be discussing today, all similar but each different from the other. These books were given to me free on charge in exchange for my honest review. 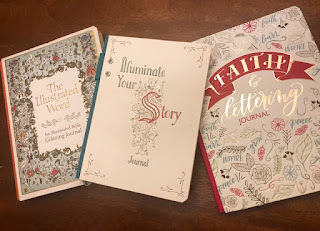 The three books, Illuminate Your Story, The Illustrated Word, and Faith & Lettering Journal all have the same premise. They "teach" the beautiful script and illustration styles that you see in religious texts. Illuminate Your Story is the smallest of the three books and is from the Museum of the Bible. This book starts by focusing on the history of Illuminated letters and the various styles and the process involved in the intricately made illuminated Bibles and prayer books of ancient times. The remainder of the book is step-by-step written and visual instructions on how to do each letter of the alphabet. While there is room to practice each letter, there are also a few blank lined pages included every few pages to give you the opportunity to practice more in-depth. The Faith & Lettering Journal is by hand-lettering artist and graphic designer Krystal Whitten. In the introduction she explains how she was first introduced to the art of lettering and how, when she first tried lettering using Exodus 14:14, the slow process of drawing, erasing, and repeating became a powerful way to memorize scripture. This book focuses less on that initial first letter of illustration, and instead focuses on various styles overall. There are plenty of practice pages, both lined and graphed, as well as quotes and scripture to practice. She even goes over embellishments such as scrolls, containers, banners, and arrows. I see this style of art all the time on Instagram! So many home decor items utilize these styles as well! The Illustrated Word is the largest book in the collection. Like, Illuminate Your Story, this book is also from the Museum of the Bible. This book is more of a coloring journal. There are blank lines and every few pages there is a coloring page. The coloring pages remind me of a biblical adult coloring book. They pages are actually inspired by the Museum of the Bible's collection of illuminated manuscripts. 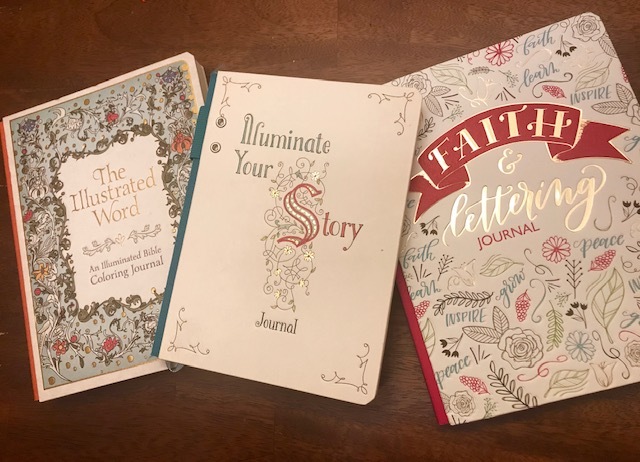 Each of these books (or all three) would make a really original gift for Christmas, a birthday, or even a confirmation. Each of these addresses lettering and illustration in a different way so I would recommend getting all three. Ok, wow guys, it's been a long time since I've blogged about a product! So sorry about that! I guess I just have to wait until I find a product that's worth it! Not only is this product worth it, but it showed up at the PERFECT time! A few weeks a go my go-to lunch bag got destroyed. I asked a few people for catalogs as the brand that mine had been but then I had the opportunity to review one! There were 5 different color options: pink, ivory, green, yellow and blue. Obvs, I chose pink. This girl loves her pink. Anyway, I love it even more than I expected! It's the perfect size for lunch and I love the color. It's super soft material but thick enough to keep my lunch cold between home and work. The zipper works smooth and feels like it's good quality, I don't see it breaking any time soon. I don't like that the pink material and the zipper material are different shades of pink..one looks a little orange-y next to the other one but not a big deal. It's still an overall improvement over my last one! Even though I did get this product free to review, I'd still recommend it to anyone looking for a new lunch bag. To get your own, go here! I got this for a free or reduced cost in exchange for my review! To get your own, click here! I've been doing more yoga the past few months, and I've had a yoga mat that I thought was working just fine, but I got this one to review (for a reduced cost) and it is SO much better than my old one. The non-stick grip of the bottom doesn't slide on my hardwood floors at all and the top layer is soft and supportive at the same time. Check out my video for more details, and then buy one for yourself! You can find them here! I did receive this product at a reduced cost in exchange for my review! Before we get too far into 2017, I want to talk a little bit about my favorite products and services on 2016. I tested hundred of products in 2016 - some for free, some discounted, and some I stumbled upon on my own and realized I'd found something great! These products are some of my favorites and will probably find their way into 2017 as well. Just so you know, many (but not all) of these products have referral links that benefit me if you use them (but probably benefit you as well! ), but if I don't love the product, it didn't make this list. None of these items are added simply because of a referral link. What is it? Amazon Smile is everything you know and love about Amazon.com - but with the added bonus that it will donate a portion of qualifying purchases to your favorite charity. Anytime you would normally go to Amazon.com - go to Amazon Smile instead. To get started, go to the Amazon Smile site (link above) and pick the charity of your choice (I recommend Junior League of Owensboro), then continue to shop as usual. It's that easy! What is it? Pura Vida bracelets got their start when two guys took a college graduation trip to Costa Rica. They encountered 2 very poor men selling handmade bracelets in an attempt to support their families. The college graduates asked the men to sell them 400 bracelets to take back home to California. The bracelets sold quickly which lead to the successful operation they have now. The two poor men they initially encountered now have full time jobs making bracelets...as do 100 of their friends. All bracelets are handmade by artisans in Costa Rica. The colors are not just for appearances...many of their bracelets represent specific charities, including everything from animal awareness to environment causes to cancer awareness to military to education and more. To date, Pura Vida has partnered with over 190 organizations and donated over $1 million. In addition to bracelets, they now have rings, bikinis and other accessories. Use the promo code above for 20% off! What is it? Oh where do I start....I've been doing StitchFix for over 3 years. At times more frequently than others...StitchFix is almost a subscription box, except you pick how often and when you receive it. To begin, you create a profile that includes questions about your preferred style of clothing, sizes, favorite prints, etc. Then, for $20, a stylist will pick 5 items and send them to you. You only pay for what you want to keep and you send the rest back in a prepaid envelope that comes with your Fix. If you keep all 5, you get a 25% discount! I recommend being a specific as possible when filling out your profile and you should always, always, always link up a Pinterest board with your StitchFix account so your stylist can see what types of outfits you like and learn a little more about you. If you aren't happy with your first Fix, don't give up, the longer you do it, the more they learn your style! Remember, you can get the box as often or as little as you like! What is it? A daily email (weekdays only) that catches you up on what's happening in the world! Don't be left in the dark on current events or breaking news - this is basically the Cliff Note version with a little bit of sass so you can be in the know without reading the New York Times every day. Link: http://fbuy.me/eQg91 (this is a referral link that will get us BOTH a free set of filters! What is it? Be honest....you do NOT change your filters to your HVAC system as often as you should. Regular filter changes keep repair bills down, decrease your energy bill, and keep you healthier! FilterEasy helps with that. You tell the company how many filters you need, how often you would like to change them, what size you need, and your choice of 3 different quality filters..and they automatically ship them. If you need help figuring out the answers to the questions above, they are ready to help. I get mine shipped every 2 months. My filter is on the floor and with my dog it gets bad pretty quickly. They don't charge your credit card until it's shipped and send you an email when it's on it's way. This is SO convenient for someone like me who may not ever remember to change my filters if they weren't sent to me! This service has been great for me! What is it? This is a subscription box geared towards men, but there are some fun things for women too! Each month there is a new box, you have 4-5 days to Opt out or switch your box if there is a different one you prefer. One thing I love is that they email you to remind you so you don't forget to opt out if you choose to do so. You can opt out as often as you like (I may only get 1 a year). These make GREAT gifts for boyfriends, husbands, dads, brothers, etc. I've admittedly purchased 1 or 2 for myself. If you have any questions about the above products, feel free to ask me! They're all great products and hopefully you think so as well! Cold brew coffee is in. Starbucks has it. I love it. I buy cold brew coffee when it's -12 outside. Actually, it hasn't been -12 yet this year. Give it time. The problem is that, with any specialty coffee, buying it every day gets EXPENSIVE. This gives you a way to have your cold brew at home! The amazon page for this product provides a great video on how this works (Amazon link is here). I love the idea behind this...and that the lid can go straight on the tumbler on the bottom! I've tried this one time and the result was pretty weak. As in, the coffee was weak..you could definitely see through it which means it's not fit to drink. The system works though. I'm currently brewing a second "batch" and it's coming through much darker but I used more coffee than the instructions called for so keep that in mind. Clean up is a little bit difficult. There's no throwing away a tiny Keurig cup or picking up a filter that has all the grounds in it. You have to clean this out..which is difficult if you don't want a bunch of coffee grounds down your drain. Overall, with a little bit of trial and error, I like this product and can say I recommend it, just remember to use more coffee than it tells you that you need! **I did receive this product for free in exchange for my honest, unbiased review.